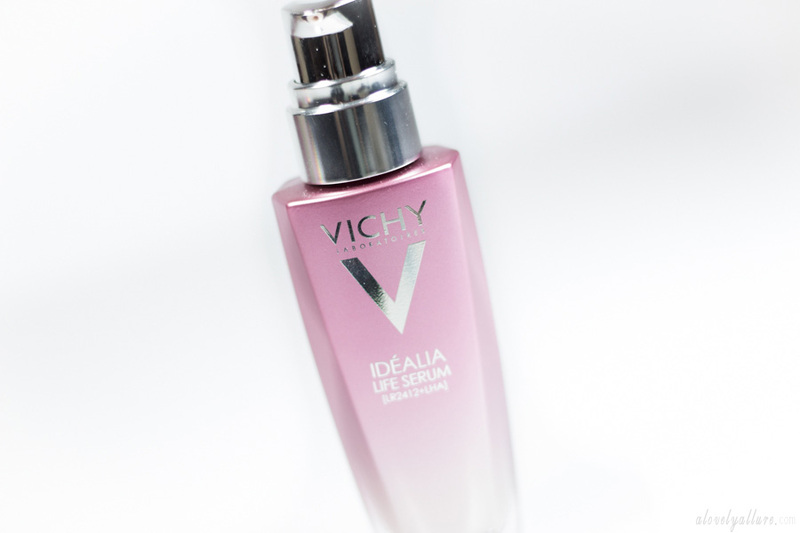 Vichy Idealia Life Serum is the first skin idealizer serum that works under your moisturizer in the morning-as a radiance primer and at night, to help combat behavioural aging and improve skin quality. It claims "even and illuminated complexion, refined-looking pores, and rested facial features". The primer is safe for sensitive skin, and suitable for all ethnicities and skin types. It is hypoallergenic, non-comedogenic, and paraben-free. Upon receiving this product I was a little afraid to use it because I had no idea what LR2412+LHA was (I briefly explain below!) But the though of a product to help prevent and improve signs of behavioural aging was quite interesting! Behavioural aging can include aspects that we all suffer from, whether it is on a daily basis or not, such as... lack of sleep, pollution, stress, unbalanced diet, lack of sport, hormonal imbalances, UV rays, and dry weather. Studies through L'Oreal Canada Research have shown that at least 7/10 women carry out at least one of these daily actions that negatively affects their skin quality. 1/2 Canadian women are affected by both stress and lack of sleep. LR2412 is actually a jasmonic acid derivative and claims to be one of the most promising anti-aging molecules. It works by accelerating epidermal repair and improves the skin's ability to protect itself. LHA is a derivative of salicylic acid that stimulates cellular renewal in tired skin, and reduces pigmentation flaws. It improves the quality of the complexion by increasing reflection of light on the surface of the skin. Both ingredients together work to improve skin complexion, colour, and elasticity of the skin. 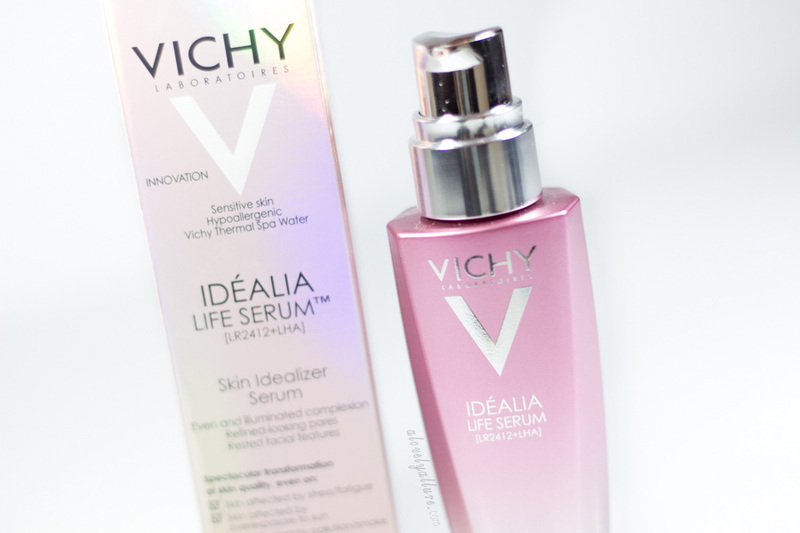 First Impressions: I've never given Vichy a second glance before trying this out, but after successfully trying out one of their Aqualia Thermale creams with no break outs, I began using this every morning, before moisturizer and foundation. I fortunately did not break out, and really enjoyed the light floral, jasmine scent. I noticed little golden and pink reflecting sparkles in the serum which is definitely the illuminating factor of the serum. 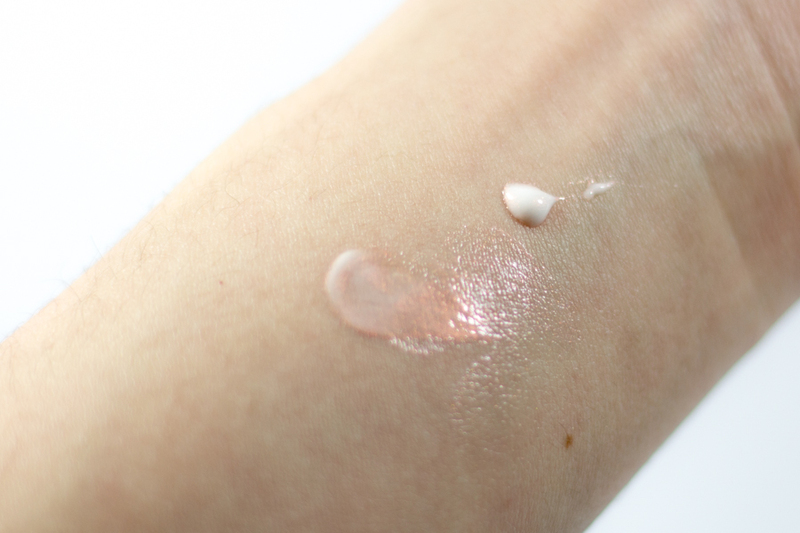 It is non-greasy, feels very light on the skin, and completely dries in a couple of minutes. Did I like it? I don't even know how to describe this product without giving you the impression that I'm trying to sell it! First of all, after using this for a few weeks, I felt more confident with my skin. I actually have begun going out without makeup on, where I typically wouldn't at all. I noticed when applying this before my makeup that I didn't need a moisturizer, but now that it's much colder and the air is so dry, I do apply a bit more moisturizer along with this serum. It definitely adds radiance to my skin right when applied, and I do notice an improvement in my skin-tone and pores. I seem to be experiencing less redness overall. It works great for my sensitive skin and I did not face any negative reactions! The best part about this serum is that my friends actually noticed a difference in my skin tone! I have never used a skincare product before that has actually been noticeable to others. I actually had a few friends say that my face looked 'flawless' and 'brighter' after using the serum for a couple weeks! I've actually switched to an all Vichy routine because I was hoping for even more hydration. I would apply the Idealia Life Serum in the morning, then their moisturizer, and cleanse with Vichy's milk cleanser at night. My skin has been feeling much better than it has in a very long time. So yes, I love the serum and I would definitely recommend it to all of you if your looking to combat behavioural aging and would like a primer that will illuminate your skin, and give you a brighter complexion. I would recommend maybe asking for a few samples first, so you can try it out before spending the money on it! It is an expensive serum, at $59 for 30 ml, but so far it seems I haven't used too much more than 1/4 and I've been using it for almost 2 months. I will for sure repurchase it (during Shoppers point specials, of course) when I run out. You can find Vichy products at Shoppers Drug Mart in Canada, or internationally at Boots, Walgreens, CVS, or online at Escentual in Europe and the UK. Edit: If you are looking for something a little lighter that absorbs faster and is more affordable, I'd suggest NSPA's Illuminating Beauty Serum/Radiant Flash Serum!